OCL Celebrates the 20th Anniversary of the Resolution calling for Autocephaly of the American Orthodox Church. It is more relevant now, but little progress has been made (see text below). 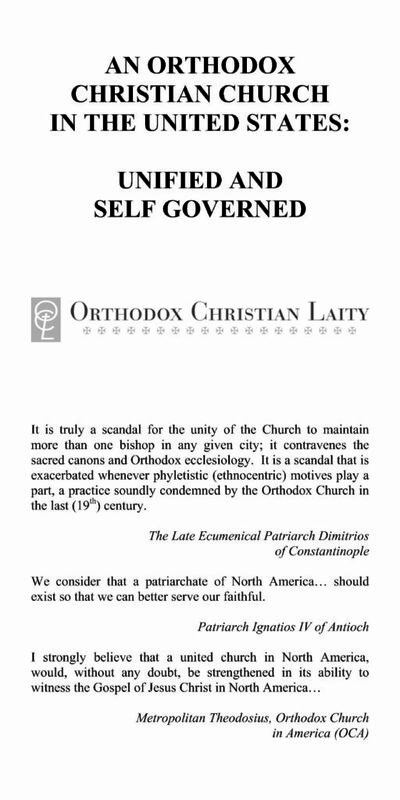 In 2018, Orthodox Christian Laity is celebrating the 20th Anniversary of its call for a self-governing American Orthodox Church. The OCL Board passed this resolution on October 10, 1998, in Los Angeles, California, at its 11th Annual Meeting. As you can see from the wording of the resolution, much has changed in the Greek Orthodox Archdiocese and with the relationships of the parallel Orthodox Jurisdictions in the United States to each other. The reality is that today, the Orthodox Christian Church in the United States is more fragmented than ever. It remains uncanonical in its administrative and organizational structure. This fact is recognized by the autocephalous and self-governing Patriarchs and hierarchs in Europe and other parts of the world who have set up the Assemblies of Bishops to find a remedy to regularize the disorder here and in other regions, to assist the Church to become locally self-governing. However, the Assembly of Bishops in the USA seems stuck in the groove of fragmentation. It has been meeting for almost 9 years with little progress. It is necessary for the Patriarchs to declare the Churches in the United States self-governing. The synod of bishops of the Orthodox Church in the U.S. needs to be composed of all the canonical Orthodox Bishops presiding in the United States of America – all 58 of them. They need to elect their own head to be Patriarch of the Church of America. Together they can work out all the considerations they presently have. The Patriarchs will be strengthened by this reorganization of the Church in the United States, because they are the roots. The Church in the United States will be part of the worldwide, multicultural Orthodox Christian Church. If the Patriarchs do not act, the time has come for the bishops here to take the necessary actions so that the Church ceases to lose its flock. Just look at the census and statistics of marriages and baptisms. As we celebrate Pentecost, as we celebrate the love of the Holy Spirit – the Spirit of Truth, as we celebrate Christ’s Commission to bring the faith to all people, the status quo is unacceptable. The internal structures of the Greek Orthodox Church (GOA) are more fragmented than at any other time in its history. The Patriarchate has used the ancient practice of divide and conquer. The establishment of separated metropolitanates, whose heads report to the Patriarchate, has weakened the Archdiocese. Each metropolitan sees himself as a self-governing potentate within his Metropolis. This has weakened the office of the Archbishop of the GOA who has been undermined by this system. 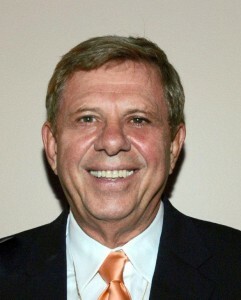 In addition, an “unofficial parallel Patriarchal nuncio” has been given unlimited power in the United States of America because of his relationship with the major donors of the Church. This office undermines the authority of the office of the Archbishop. The Charter of the Archdiocese has undermined the participation of the laity in the administrative life of the Church. The laity are looked upon as a source of revenue and are asked to pay and obey. The administrative structure of the Archdiocese lacks transparency and accountability. The Archdiocesan Council, which is appointed, has not been actively involved in matters of governance and accountability. Many factors have contributed to the bankruptcy of the Greek Orthodox Archdiocese. It is not fair to lay the blame on the office of the Archbishop. The Office of the Archons needs to inform the Patriarchate of the true situation of the life of the Church in the United States and not just be the advocate of the office of the Patriarchate to safeguard its stability in Turkey. Replacing the Archbishop will not solve the difficulties of the Archdiocese. The Archdiocese needs to be restructured, and the uncanonical structure of administration allowing parallel jurisdictions to exist, and in some cases, compete with each other, causes endless unnecessary duplication and waste of resources. This needs to be remedied. Orthodox Christian Unity is the canonical solution. No more ethnocrats guiding the Church. We want shepherds who know and love Jesus Christ and are not distracted by politics across the ocean. I am trying to keep an open mind on this. But numerous questions arise, and it is best that a consensus on them emerge now rather than simply declaring an autocephalous status as a fact and then dumping the details of its implementation upon the 58 canonical Orthodox bishops in the US. What would happen with the complex and as yet not fully understood financial mess of the Greek Orthodox Archdiocese? Will the St Nicholas Shrine be completed and with whose money? What kind of varying retirement arrangements currently exist for the clergy of the various separate jurisdictions and what would be done in the future concerning them? Who would be the bishops over some of the US areas where Orthodox Christians are most common: Boston, New York, Chicago, Los Angeles? What guarantees of tolerance would exist concerning harmless variations in Orthodox worship that have developed during the course of the last hundred years in the US, such as using or not using organs with the choirs? Finally, what assurances could we have that the government of Turkey would not see this as a green light to take adverse actions against the Ecumenical Patriarchate of Constantinople? Some answers to these questions would be good now, not later. John S, the question to ask is simple and direct, what is God’s will for the Church. Even if problems are encountered, God’s will must be preeminent. Look, the OCA, Orthodox Church in America, is the only autocephalous Orthodox Church in America. It was a result of SCOBA’s agreement in 1961 to establish an unified, autocephalous church in America that ALL Orthodox jurisdictions would join. + Iakovos & + Philip had agreed to this. In 1970, the adviser to SCOBA, Fr. Alexander Schmemann made this a reality by procuring autocephaly for the former daughter church of the Russian Orthodox Church, the Metropolia. In the minutes of SCOBA, it said that this church should be called, “The Orthodox Church in America.” The Bulgarians joined the OCA; the Albanians joined the OCA; the Romanians joined the OCA and others, but both + Iakovos and + Philip RENEGED. (Probably due to the push-back from their Old Country Patriarchs) So, 48 years later, the Orthodox Churches in America still are not united. The Canons of the Orthodox Church are clear, bishops (patriarchs) CANNOT form dioceses outside their own territory, yet what was originally missionary activity, has developed into permanent dioceses of foreign Patriarchs. SCOBA addressed this and solved it with the formulation of the OCA. What is the GOA and AOCA waiting for, the PAROUSIA??? we need unity among all Orthodox Churches that uphold the canons, the church Fathers, the 7 ecumenical councils the seven Holy Mysteries and to walk in brotherly love, i have experience and met so many Orthodox Christians that left the church due to the lack love and charity towards one another and the judging and fighting within it. People are praying for unity with the Roman church where as we should be praying for unity and love and forgiveness within our own faith the Eastern Orthodox Church. So many dissensions so much nick picking and judging and condemning. Would our Precious Lord Jesus we happy about this or sadden. Let us pray for peace and keep the politics out of our faith and focus on Jesus Christ and on the truths and beauty of the Orthodox Faith/church which he has purchase with his precious blood. Let us all come together and put aside the things that greatly divides us. Right now we are a frayed canvas needing to be repair and restored. Now almost a week has passed since this article was posted. I asked certain crucial “housekeeping” type questions at that time. Since then three good comments have been made. There were the inspirational words of Bishop Gregory and of JohnKal. And George Cantopolous quite correctly pointed out that the leadership of the Greek portion of our Orthodox diaspora in the US has been resistant to the movement for autocephaly. Still, I do hope someone on here will also address the housekeeping questions I posed in my earlier comment.